Painters of the 19th century were all in the habit of making small paintings. The Spanish painter Sorolla’s small paintings had rich colors and free flowing strokes while Levitan’s had very concise yet elegant color blocks. 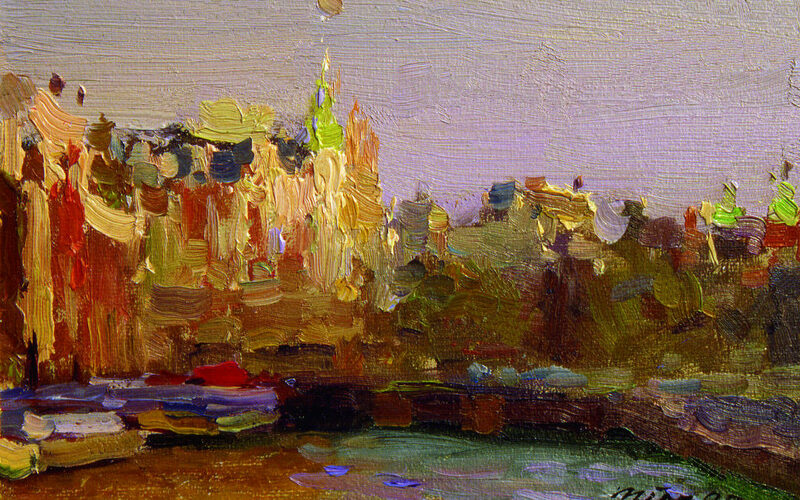 Even the Russian painter Fedotov’s exquisite small portraits (6 x 8 inches) contain great use of colors and brush work. Many of the small paintings by the great masters in Europe at the time were masterpieces in their own right except they rarely appeared in painting collections. 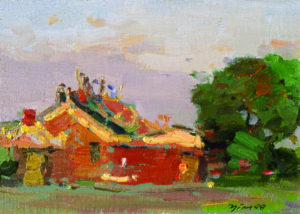 Small plein-air paintings offer only a limited amount of space and time to work with so it forces us to explore the relationship between the major color relationships. It is therefore very effective for training “color use” and force us to see the forest, not the trees. To begin with, avoid small and intricate objects when deciding on the scenery and layout such as twigs, vines, wires and window lattices. For lawns, vegetable patches and bushes you must simplify the brush strokes and turn them into blocks of color. When the scenery is translated into blocks of colors that vary in their color temperature and value, the painting becomes more interesting and the experience becomes more rewarding for the painter. If you aren’t prepared to simplify the complex and try to put every little detail you see on canvas, you will ruin the small painting and end up with a mess of broken elements. Levitan believed that in landscape paintings the mission could be summed up as dealing with the relationship between the sky, ground and water. This is important wisdom from masters before us. For the first step, you indeed have to separate the sky, earth and water in terms of how bright the color blocks are and the colors used. If you have the relationship right, the general layout for a small painting emerges. This was what the Russian School introduced. When the “gray tone” is added, it achieves very effective results. Back in the 1950s it quickly spread among the art institutes and added new vocabulary to Chinese oil paintings. Space is the soul of the landscape painting. 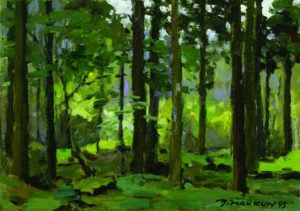 The brushwork gives landscape paintings their charm and this is particularly true for small paintings. On a basic level, it “translates” the scenery that we see into impressions of different color blocks. The next step is naturally using brushwork to express these color blocks. While thick and broad strokes can be quite effective, if these are not balanced by subtle gradients of color then the bold strokes become primitive and simplistic. While small paintings are usually done quickly, in my experience taking too little time easily led to them appearing vapid. I usually allow for forty to fifty minutes, giving me time to go back over the tones and color blocks or give the key points or details some extra attention. I try to make the small paintings more than painting exercises or records of large color blocks so they could have more of their own artistic merit. Generally I start by using the cyans. Sometimes I use the browns to “touch up” the dark parts. I don’t usually use oil for the block-in nor for mixing colors when blocking in. 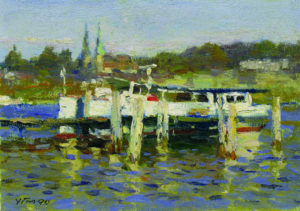 The oil would blur the image easily, leading to faulty or dirty colors. In summary, plein-air landscaping is a process where natural (objective) beauty is fused with artistic (subjective) beauty. Natural beauty emphasizes the “feel” while artistic beauty focuses on the “appeal,” or in plainer terms, “fun.” If you become fixated on pursuing realistic details, painting becomes a chore rather than pleasure. Conversely, if the brushwork and colors depart too much from the natural scenery, the scenery itself falls apart and loses its feel. What’s left are scribbles of brush and ink bearing no resemblance to the essence of plein-air painting. For me, the mini-landscape painting is the best and most pleasant way to converse with nature. I have always loved small paintings and my heart has remained true for all these decades. Such is the magic of small oil paintings! I love small paintings and that is the bulk of my work. While I was encouraged to go larger, after seeing Sorolla’s works and MauKim’s, I decided to stay true to my love. There is something so fresh in these small gems and much value in being able to test ideas that perhaps will translate to larger works. Thanks so much for these gems of wisdom! I really appreciate it!! Hi, Elizabeth, we’re glad you found the blog post helpful 🙂 Both small and large works have their own merits. But small works is more fun because its spontaneity.